Click here for the page which contains all the pix from Sun July 21, Travel Day. 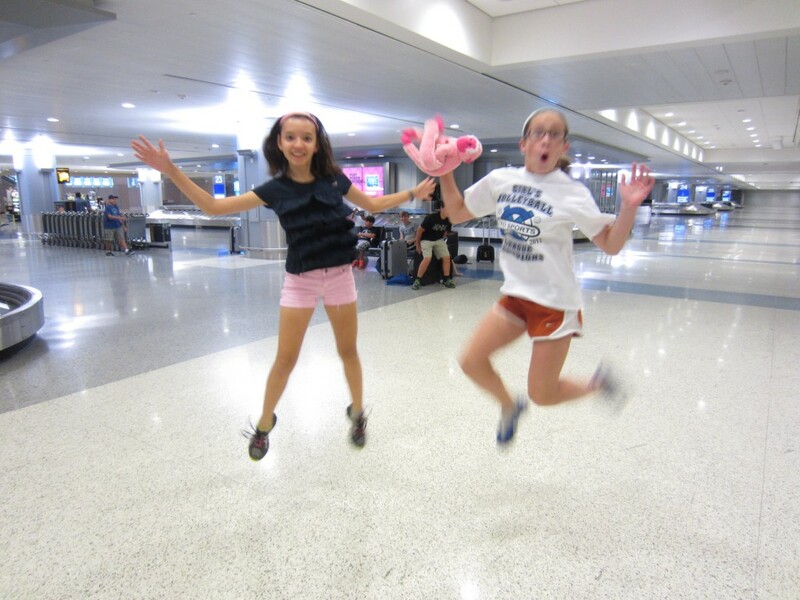 Grace and Julia have fun at the airport. 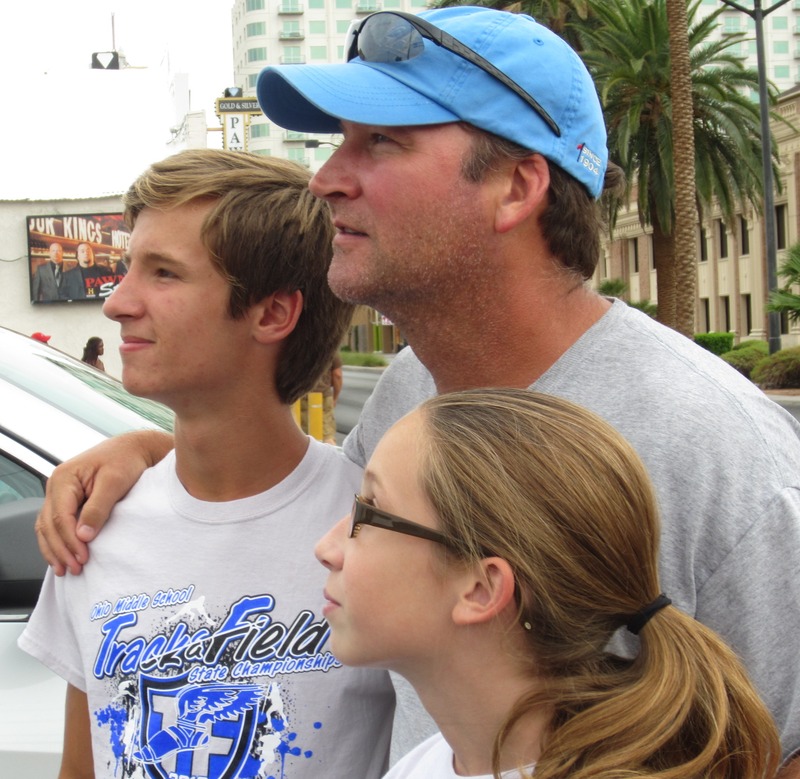 The Dean family in the parking lot of ‘Pawn Stars’ shop. All the flights were on time and without incident. Many students fell asleep on the 1st leg of the journey, but a few younger students stayed awake playing videos. Christopher Samaan was quite animated about the progress of his game. The 45 minutes of sleep which Kelly McBride got the night before caught up to her. Tino Delamerced did some studying on his computer. Tullus read about the late emperors. Julia alternated between her ipod and sleep. During the 2nd leg, I watched the British Open the whole flight, but was not able to see the exciting conclusion because the flight ended. But I know my Dad was happy that Phil the Thrill won another major. 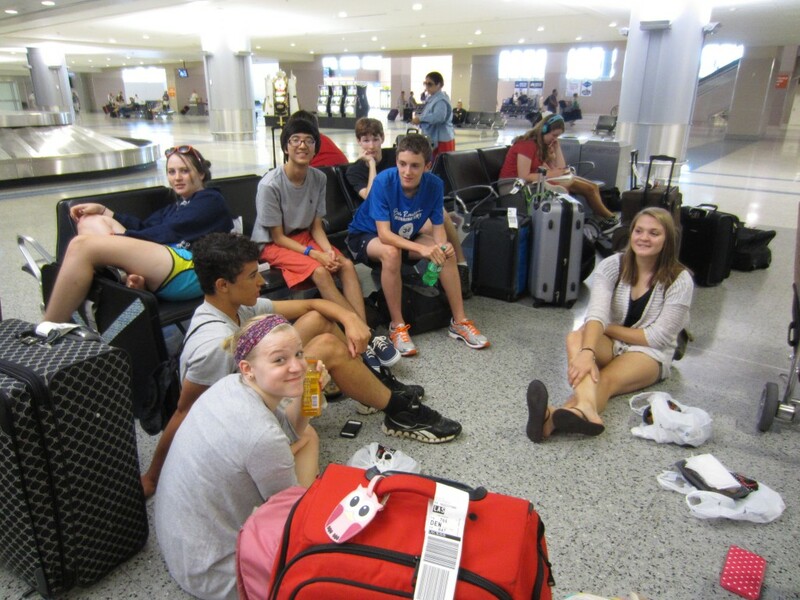 Students relax at the Vegas airport. Most people got Burger King at the Vegas airport before the bus tour. Jesse Campbell got a double breakfast. Nathan Whitsett and Kevin Boyce passed the wait time playing cards, Summit alum Dylan Chambers read his book, Mollie from McAuley socialized. Sunanda Tamrakar and Elisa Stanis hit Starbucks for the 2nd time on the trip. 2 Texas JCL’ers spotted us and saw we were also going to the convention. They had no plans for the day, so Michael and Angel both joined us for the tour of the city. 40 foot clown: the stuff of nightmares. 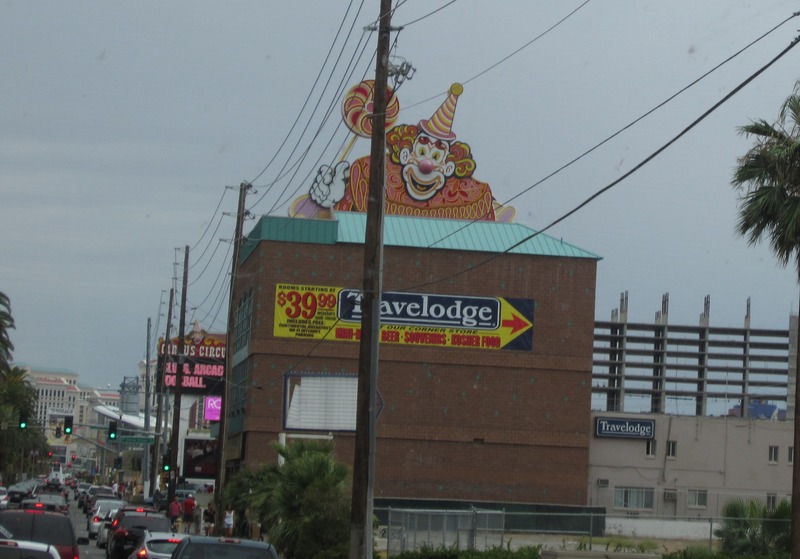 There was a lot of traffic on the strip at 1 pm on Sunday. I mentioned to Tullus that he should ask the driver if we can stop at the ‘Pawn Stars’ shop, which caused a spontaneous ‘pawn stars!’ chant from many students on the bus. (It is a reality show about a pawn shop in Vegas.) Well, sure enough, within 15 minutes, our group of 30 was filing into the store. 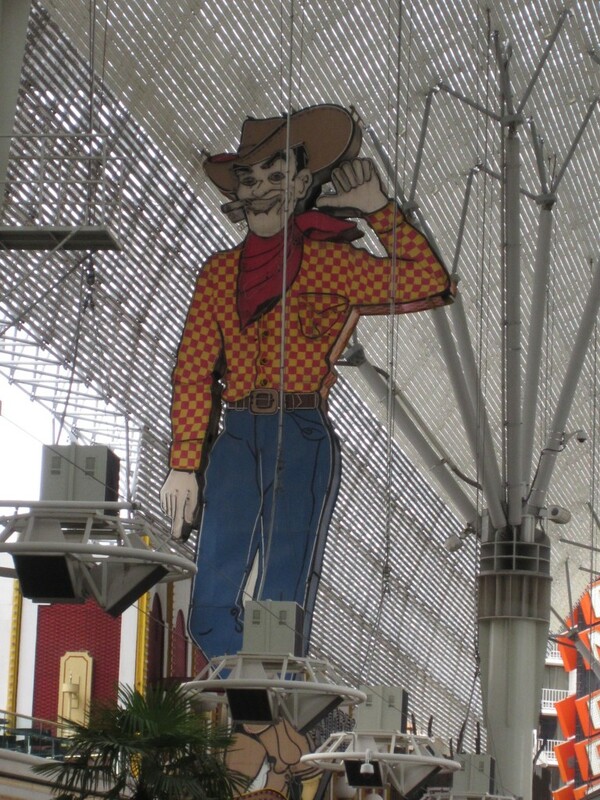 On one side was one of the ubiquitous Vegas marriage chapels, and on the other side was a place of adult entertainment. Tullus got a postcard signed by one of the minor stars of the show. Next stop was the old Fremont strip. It was nice to stroll around and people watch. Some students got gelato. I stopped by Walgreens for some drops b/c my contacts were really bothering me. They did not help very much. Dustin Argo and Michael Warden dazzled their peers with some great card tricks. There is a Starbucks on campus. Euge! Julia got to meet my Latin teacher, Sue Robertson, who as Convention Advisor helps to run the whole thing. Tullus had met her last year at Wake Forest. As I mentioned last year, Sue went to high school with my stepmom Tricia, taught me and my siblings Shelly/Paddi/Eddie/Fletcher, and helped Andrea to get her teaching job at Indian Hill. So there is quite a history there. Turpin students Lindsay Dierig and Emily Brown did an original song about Oedipus – the guy who (unknowingly) killed his dad and married his mom. Check it out here. Teachers Rachel Kless and Melissa Burgess are here, with K.C. and Todd back home taking care of the kids. Dads Rule. And so do Moms. Not too hot here today, but it was humid. Reminded me of OH, in a bad way. St. Edward teacher DJ Cavoli missed his flight out here. According to anonymous sources, this sort of thing is not atypical for him. He will arrive here late tonight. Tom Carroll (Westlake), Carolyn Boyce (Summit), and Myles Casanas (Summit) completed their 1st year of college and now will get the ‘Senior Classical League’ perspective on convention. Grace Sambora of Dayton was happy to see her old VA friends. Teacher Emelie St. Cyr is now officially Emelie Inderhees! I missed the wedding b/c of family vacation, but the happy couple looks great in the pix of the nuptials. 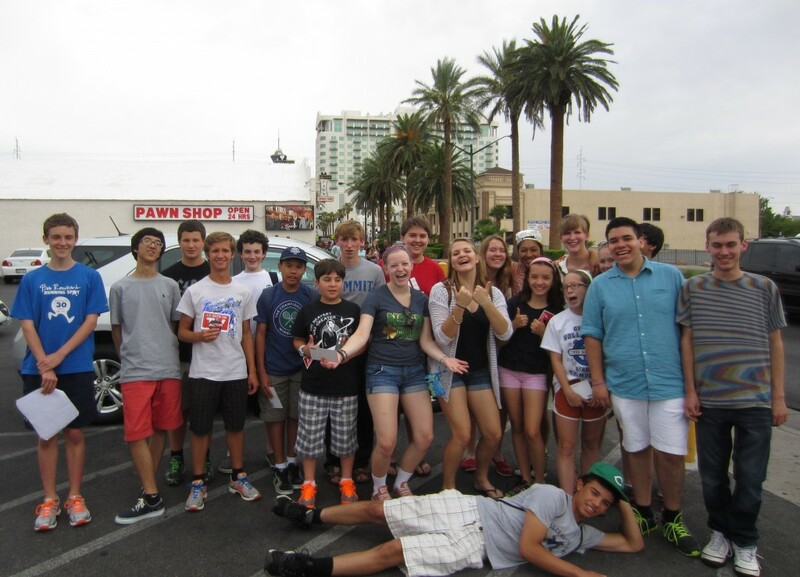 Most of the group poses for a picture at ‘Pawn Wars’ shop.